On Friday we shot the final scenes of our film. 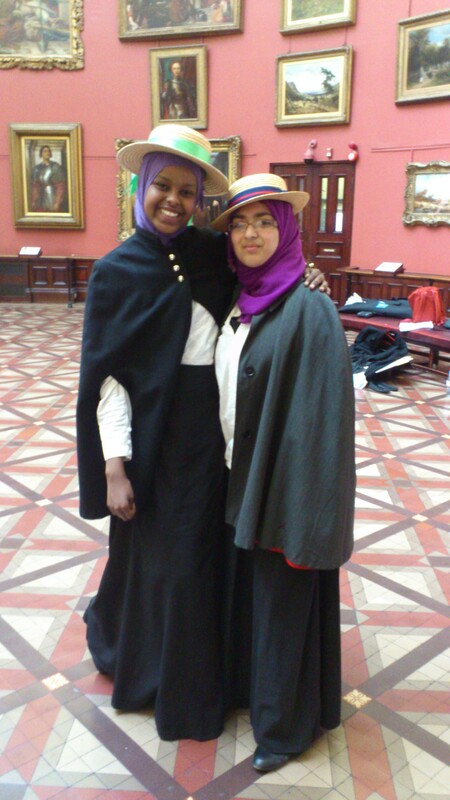 Nibah, Adna, Falis, Faisa and Najma from Waverley School came to Birmingham Museum & Art Gallery to shoot scenes that focused on Bertha Ryland, Hilda Burkitt and Ellen Barnwell, three suffragettes who were involved in different incidents that took place in the city between 1909 and 1914. 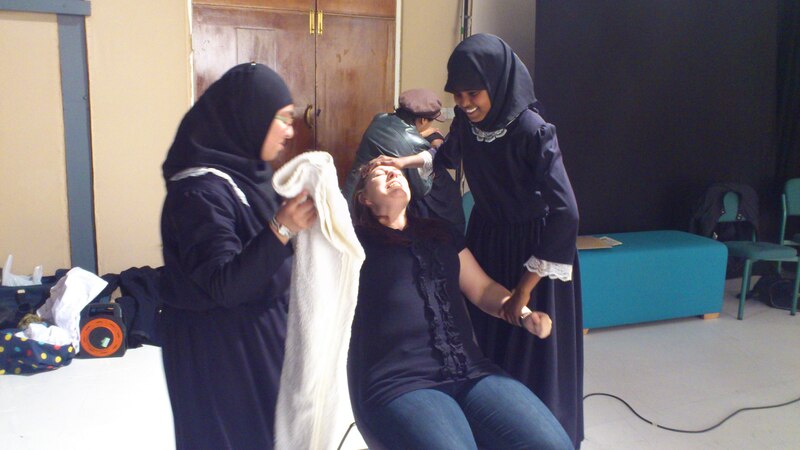 We also shot some scenes that were based in Winson Green prison, the location of the first forcible feeding of a suffragette, Hilda Burkitt. Bertha Ryland going to attack painting! We were also pleased that Norman Bartlam from TNT News could join us. 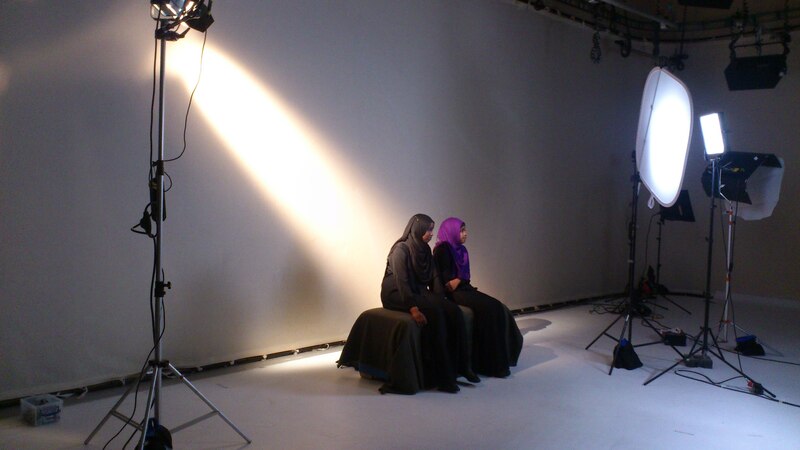 Nibah and Adna were interviewed about their experience working on this project. The film should be available on the TNT website sometime in June. And last Monday a few of us went onto Adrian Goldberg’s radio programme on BBC WM! It was a really exciting week for us. 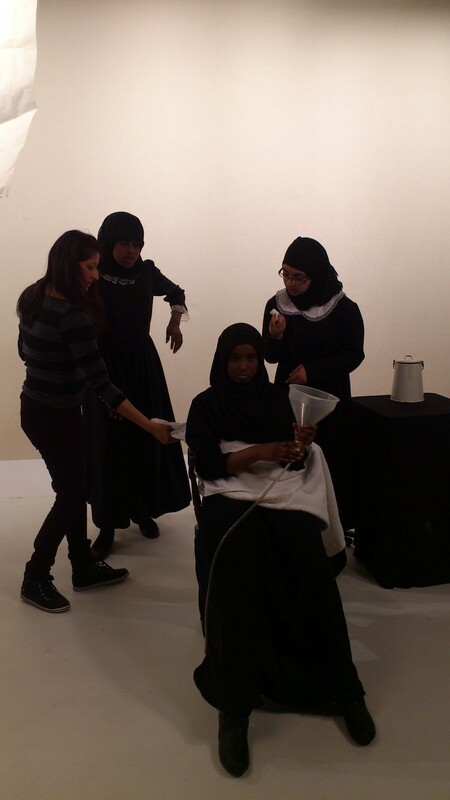 Now we’ll be working on editing the film and preparing for our launch events. As part of preparations for our trip to London we had hoped to have time to visit the National Gallery to see the painting that was attacked by Mary Richardson in 1914. Unfortunately we didn’t make it but I wanted to share what we found out. Mary Richardson’s attack was not the first of its kind, a number of paintings had been slashed in Manchester Art Gallery in 1913, but it was probably the most high profile of these types of attacks. Richardson was a Canadian, born in 1889; she was a devoted supporter of Emmeline Pankhurst and active member of the WSPU. She had been at the Epsom races on Derby Day in 1913, when Emily Davison died. Richardson was chased and beaten by an angry mob after the incident and was given refuge in Epsom Downs station by a railway porter. She committed a number of acts of arson, was involved in smashing windows at the Home Office and helped bomb a railway station. Overall, she was arrested 9 times in total for her actions and received prison terms totalling 3 years. I felt I must make my protest from the financial point of view . . . as well as letting it be seen as a symbolic act. I had to draw the parallel between the public’s indifference to Mrs Pankhurst’s slow destruction and the destruction of some financially valuable object. Mary had been an art student and knew the paintings in the National Gallery well. She decided upon the Velazquez Venus, ‘it was highly prized for its worth in cash . . . the fact that I disliked the painting would make it easier for me to do what was in my mind’. We know that this was very much a pre-mediated attack – Mary describes how she made her plan and sent a copy of it to Christabel Pankhurst, who eventually sent a message back, ‘carry out your plan’. Then the arrest of Emmeline forced Mary into taking action. dashed up to the painting. My first blow with the axe merely broke the protective glass. But, of course, it did more than that, for the detective rose up with his newspaper still in his hand . . . the sound of the glass also attracted the attention of the attendant at the door who, in his frantic efforts to reach me, slipped on the highly polished floor and fell face downward. And so I was given time to get in a further four blows with my axe before I was, in turn, attacked. Two tourists threw their guide books at Mary, the detective sprang on her and dragged the axe from her hand, a commotion ensued and she was eventually marched downstairs to the basement. She was then taken by the police back to Holloway prison. I have tried to destroy the picture of the most beautiful woman in mythological history as a protest against the Government for destroying Mrs Pankhurst, who is the most beautiful character in modern history. Justice is an element of beauty as much as colour and outline on canvas. Mrs Pankhurst seeks to procure justice for womanhood, and for this she is being slowly murdered by a Government of Iscariot politicians. If there is an outcry against my deed, let everyone remember that such an outcry is an hypocrisy so long as they allow the destruction of Mrs Pankhurst and other beautiful living women, and that until the public cease to countenance human destruction the stones cast against me for the destruction of this picture are each an evidence against them of artistic as well as moral and political humbug and hypocrisy. 14 works of art were attacked and 9 women arrested between May and July 1914. I intended to resist to the utmost. As I sat and waited five wardresses came in. They succeeded in loosening my hands and arm from round the (hot-water) pipe; and, when they had done this, they tried to lay me flat on the floor. I struggled with them. By the time I was on my back we were all breathless and panting. To my horror, then four of the wardresses, who were all hefty women, lay across my legs and body to keep me pinned to the floor . . . the doctors came in with the hated trolley at their heels. One knelt to grip my shoulders, another lifted aloft the funnel that was to receive the liquid, the third knelt by my head and took the long tube in his hand and, little by little, forced the stiff nozzle at the end of the tube up my left nostril. As the nozzle turned at the top of my nose to enter my gullet it seemed as if my left eye was being wrenched out of its socket . . . After ten weeks of forcible feeding I was released, little better than a breathing corpse. The Rokeby Venus was quickly repaired and today the damage is almost invisible (although you can see faint white marks if you look very closely). Mary later moved to Hastings and died in 1961. While looking through the different sources at the Birmingham Archives, we came across this photograph of a painting which had been slashed three times by a suffragette called Bertha Ryland. At the time, the painting was on display at Birmingham Art Gallery on loan from a private collection. Lucy and Imogen: ‘it was a miracle that Bertha got in with the knife because everyone was checked before entering the gallery but she hid it up her sleeve. This suggests that she had thought the plan through, showing how determined these women were. 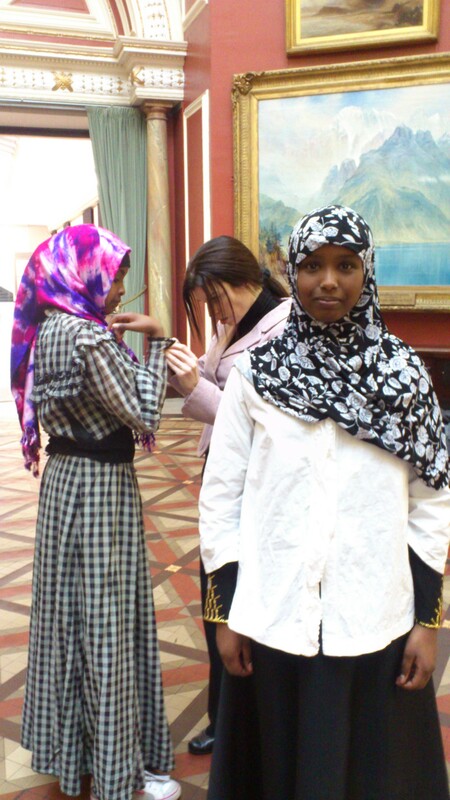 The incident had some serious consequences such as women not being allowed in the gallery as well as imprisonment for the individual guilty of the crime. It is not one of their most memorable actions by the suffragettes as if you look it up a different, more famous painting comes up. However, the action of slashing a painting at the time would have been quite shocking and would have certainly caught the publics’ attention’. 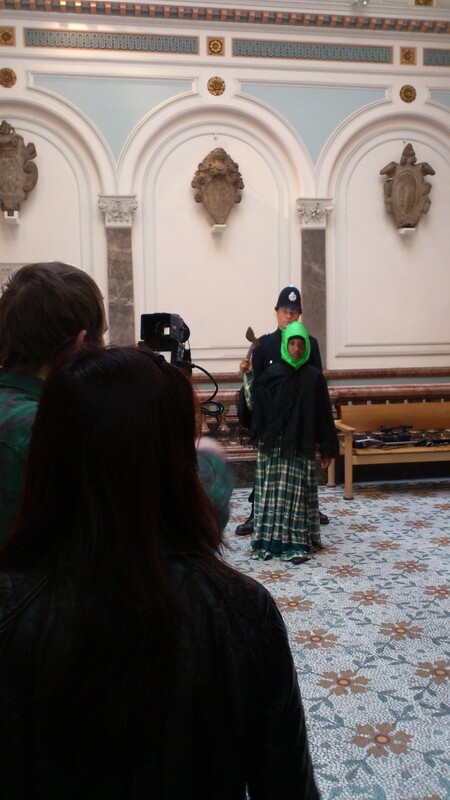 Nabeela looked at another violent incident that took place in Birmingham: ‘Northfield Library got burned down by the suffragettes, who left a book and note saying ‘this is for your new library’. The book was by Emmeline Pankhurst but we don’t know what happened to it. The suffragettes were those who were violent and were thrown in prison for their actions. Suffragists were those who protested quietly and were more peaceful’.